﻿ A Modernist Gas Station With a New Purpose | Los Angeles Flow Project L.A. Most gas stations are architecturally forgettable, but not this one. A squat, unusually minimalist service station on Nuns’ Island—a sector of Montreal that was exclusively inhabited and farmed by a religious order for nearly 170 years until its sale in 1956—holds the distinction of being the only gas station Ludwig Mies van der Rohe ever built. The building known simply as “the Nuns’ Island gas station” opened in 1969, the same year its architect, the former Bauhaus instructor famous for his “less is more” mantra, died. The building is composed of four main elements: Two rectangular buildings on either end, one made entirely of glass curtain walls and the other made of brick and glass, with gas pumps and an attendant booth on a middle island. The final element is distinctly Miesian: A large flat roof draped over the entire construction. “It’s quite exceptional to have the gas station in the middle and the two buildings to the sides. Usually it’s in the inverse: The building in the middle and the pumps around it. In the end, it looks more like a Mies building than a standard gas station,” says Hans Ibelings, a Dutch architectural historian and a University of Toronto lecturer living in Montreal. The geographic location is also unusual. The gas station is one of four Mies buildings on Nuns’ Island, which only got developed in the 1960s after the then-new Champlain Bridge enabled car access to the island. Ibelings explains that the new owners contracted Chicago’s Metropolitan Structures, an influential development company that championed Mies’s work, to help design the island from the ground up. In its original life as a gas station, the brick-and-glass building equipped with garage doors was dedicated to car maintenance. The glass room housed a small store, bathrooms, and an office. A car wash was installed in 1996. The building operated as a neighborhood service station until its closure in 2008, at which point it badly needed repairs. Montreal architect Éric Gauthier and his firm FABG—which more recently designed the seemingly Bauhaus-inspired paddocks at Montreal’s F1 racetrack—were selected to ease the gas station into its new life as La Station, an intergenerational community center. To renovate an original Mies, however, was an intimidating prospect. Gauthier didn’t want to fetishize or replicate Mies, but also didn’t want to merely restore the building. “I thought, the right thing to do was to be more Mies than Mies,” Gauthier says. He embraced Mies’s concept of buildings as backgrounds for living, and envisioned stripping the station of all of its non-essential features. Gauthier’s idea was met with some consternation from heritage-minded people, who believed the building should retain the spirit of its main purpose. “So, we decided to put our energy on one thing: The pumps. The gas pumps were not there anymore. They were the emblem, the clue that it was a gas station. So we recreated boxes there that are air intakes and outtakes for the buildings,” Gauthier says. The architects also took the opportunity to introduce geothermal energy and the Canadian well technique to the station as a way of heating and cooling it without installing rooftop equipment. That’s because the roof is the station’s pièce de resistance. 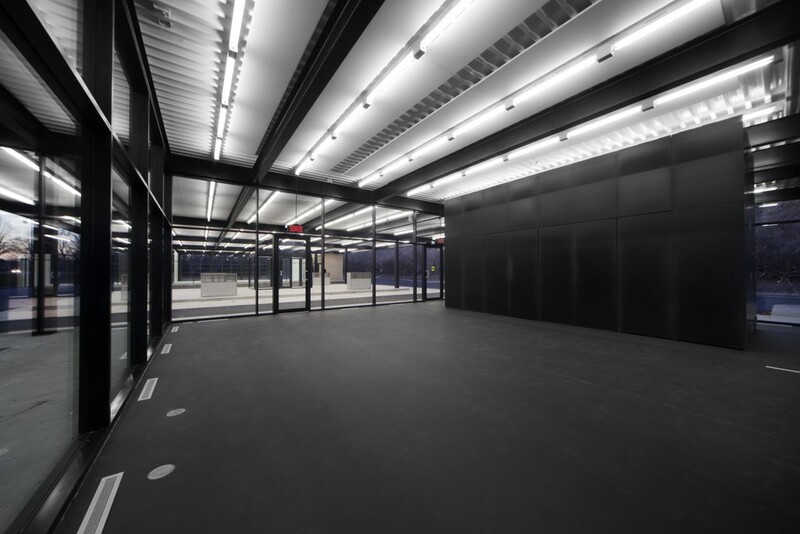 The flat steel slab was underlit by bright white neon lights, lending a strong graphical element to the station. “The dissimilation makes it a little bit mysterious,” he adds. Halfway through construction, Gauthier invited Phyllis Lambert, an iconic architect from Montreal and one of the world’s foremost Mies experts, on a private tour. He says everybody knows that her work on preserving Montreal heritage buildings was probably the reason the station was still standing. “She was very happy about the result,” he says. That was a relief to Gauthier. He’d taken great care to maintain as much of the original construction as possible; for instance, damaged and corroded metallic elements were repaired instead of replaced, though it would have been cheaper to upgrade them. He kept the non-functional garage doors and found the original shade of black paint, too. La Station has been an intergenerational community center since 2012. It’s almost a perfectly Miesian second act for something built for utility. The center’s director, Kunthy Chhim, says teens occupy the Black Room, which houses ping-pong and pool tables, couches, computers, and video-game consoles. The Black Room is the one entirely encased in glass and is named for its floor color. The White Room, meanwhile, serves as an activity center where people aged 50-plus take Spanish lessons, as well as dance and drawing classes. “I have funny pictures of older people doing tai-chi in the gas station,” says Gauthier.